We could do with some more sustained rain over the country as a whole to top up the reservoirs and lakes because last year was very dry and a lot of people were subject to water shortages. Thankfully here in Çukurba– almost all houses have a reserve water tank for such occasions and I think most village houses in Turkey have them but in the towns and cities they don’t and water is often rationed there. I have a 45 tonne water holding tank under the house so even though I might have to stop watering the garden plants we should still have enough for our own consumption. As I mentioned in a previous blog, the dogs can jump over the fence now. Well they have discovered that there is a lot of fun to be had chasing the wild boar that roam the hill at the back of the house. I let them out in the morning at about 5.30 and then again in the evening about 7.30. You can hear the boar trotting around on the rocks and digging up the soil in their search for food, then when Wilf and Alf get near them there is quite a commotion and lots of sqealing and barking. Once the dogs have chased them far enough they happily come back panting and licking each other. I think they really enjoy it, although I’m having to keep Alf here at the moment because he is limping on one of his back legs again. I got the drive entrance concreting finished last week and I’m just waiting for it to finish curing so that I can render the walls. I started using that entrance so that the clutch on the car doesn’t have such a hard time of it, the other entrance on Simon’s side is very steep and I don’t like using it really. There is still a bit more of the drive to concrete, and I will have to get on to doing that when I’ve had a little rest from it. You can have too much of a good thing sometimes. Since I got my new lens for the camera I haven’t been able to do as much photography as I would have liked but the other day I noticed there were a few birds just in front of the kitchen window so I set up my tripod and camera over the sink and draining board to see if I could photograph some. The ratio of good shots to bad was pretty awful but I did manage to get a few that weren’t too bad. Here are a couple of them, they have been cropped pretty hard and so don’t have the best detail but they could be worse. 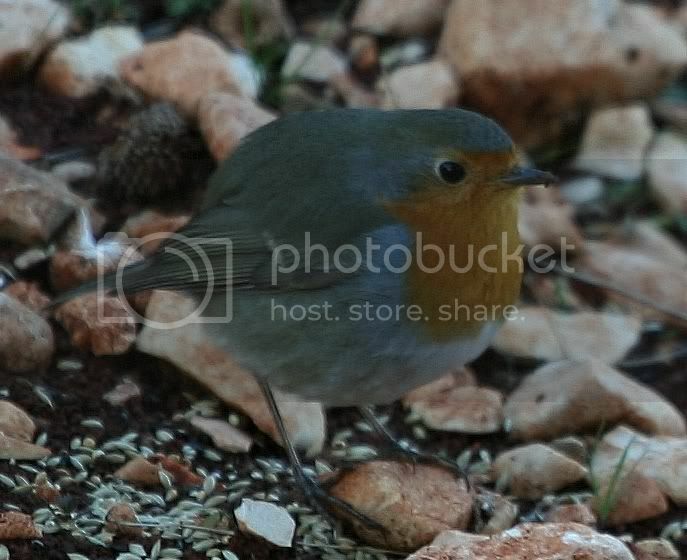 Robin, obviously pretty well fed! It’s a shame he was in shadow though. 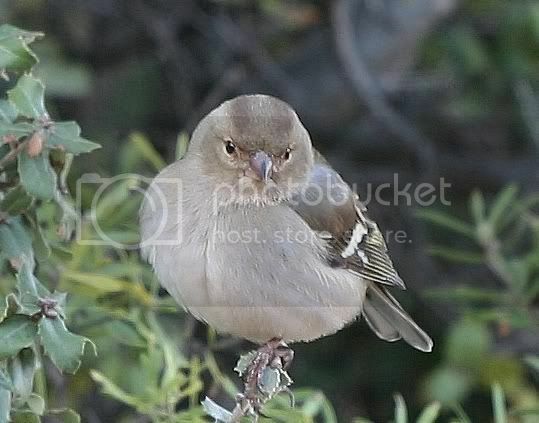 Not sure about this one, I think it’s a female Chaffinch. Anyway, I need a bit more practice but I’m quite happy with them seeing as they are some of the first bird photos I’ve ever taken. It makes a change from the pets too. The number of views of this blog is now up to 1651, I’m sure it must be a mistake, there couldn’t be that many people interested could there? But if it isn’t a mistake, thank you one and all, I appreciate your support. Just by way of a change today I went looking for buried treasure. Well it livens life’s duller moments doesn’t it? My neighbour, Ali, has been badgering me to go with him to follow up a story that somebody had told him about buried gold. Eventually I had had enough, I couldn’t think up any more excuses and I didn’t want to just say I didn’t believe it because that would have upset him so I said I would go with him. So not long after ten o clock this morning we set off in my car. We had to drive up into the mountains about forty minutes from where I live. We parked the car and walked off into the forest up a quite steep hill. The wood was fairly thick and it wasn’t easy to climb but we persevered. Ali had told me that it was about two hundred metres from the road, I think he should have added a nought because it was easily two kilometres really. The story that Ali told me was that a man was running away with some gold that he had taken, not sure where from. He had the gold, all two hundred kilos of it, on the back of a camel. Sometime during his journey the camel broke a leg and couldn’t walk so he had to put it out of its misery. He was near a well at the time so he shoved the dead animal down the well, hid the gold in the wall of the well and filled it all in covering it so that you couldn’t see it. This all happened during the first world war, at a later date an Armenian man came into possession of a map which showed the location of the well and had apparently discovered it though he was unable to dig it out and get the gold. This Armenian man met Ali and gave him directions to the well with the exhortation to go there and get the gold for himself. Ali duly went and found the place, dug out the well but could not find the gold. He thought that I, being an older man from Europe, would have all the knowledge required to know how to find the gold. Well as everybody knows all Europeans are brought up on methods of discovering buried treasure so it should be easy shouldn’t it? Anyway, back to the adventure. We were struggling on up when Ali stopped and said that we were on a camel trail. This was one of the many roads that criss crossed the land back when the camel caravans were the only way of getting goods across land. You could see quite plainly that it was a wide and easily followed trail. It conjoured up all sorts of images for me and I found it fascinating. You can see in the picture the nature of the wood that we were walking through, it is obviously ancient and unused forest apart from a few shepherds that graze their animals there. When we got to the top of the ridge there was a well! Okay that surprised me a little. 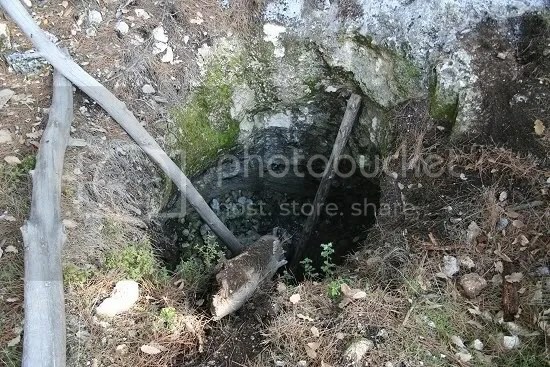 A well at the top of a ridge? You might expect one at the bottom but up at the top I found curious. Ali dismissed it and indicated that we should carry on. About a hundred metres further on there was another well. This one had been dug out of the rock and was bottle shaped inside. The rock was fairly soft but must have been a huge effort to dig out, it was about two and a half metres deep with a flat floor. Ali showed me how he’d had to line up two markers to find the well and then he and his brother had dug out all the rock and soil filling it up. He showed me what he said was a camel leg bone, and indeed it looked as though it could be, it was considerably more sturdy than any similar sized animal bone I had seen before. Being a European, you understand, I know about these things! So what to do? Where to look? We tapped the walls of the well all round trying to find a hollow sounding place but none existed. Then I looked around the mouth of the well and noticed a curious looking hump of ground at the side. I hit it with the hammer and it sounded hollow. We dug at it for a bit, it was soft and seemed to have a hole underneath but with only a couple of hammers and a little hand shovel it was a waste of time. 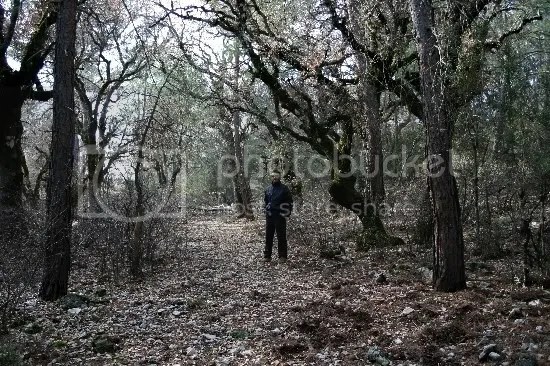 It was about that time that we heard movement in the trees a little way away from us and the sound of a woman’s voice. “Cobanlar” he said. Shepherds. I’d had enough by this time and suggested we come back another day with a couple of pickaxes and a proper shovels. He agreed but on the way back to the car he said that maybe we wouldn’t come back. We got back home at about one thirty and I gave the dogs something to eat and had my own lunch. I don’t think I will be going back because I’m now sitting on a settee with my very painful knee strapped up. It was a good adventure though, and an interesting day, I saw a bit of Turkey that I wouldn’t otherwise have seen. The forest had a very old feel to it, almost like you imagine the Wild Wood in Wind in the Willows to be. At night it would be really scary I would think, with little noises everywhere. I wouldn’t have missed it but once is enough. 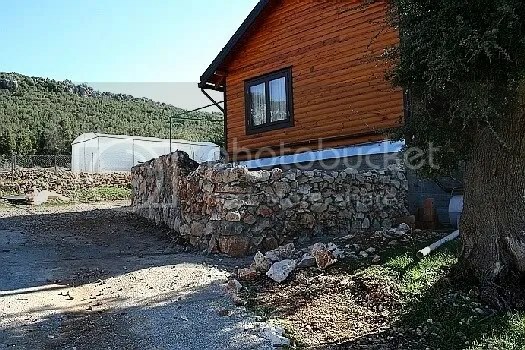 I’m trying to get the drive finished, currently working on the entrance from the road, shifting soil up to the little garden by the main bedroom and finishing off the wall around the little garden. Ramazan has been working on a friend’s house so I’ve been left on my own pretty much. It makes it much slower but I’m getting there steadily. Here’s a picture of the wall round the little garden, only a couple of feet of height left to go now. Mind you I’ve got to go and collect some more stone for it so it would probably take me a couple of days at least to finish it. I’m not going to put any pictures of the drive entrance until the concreting is finished because it looks pretty crap at the moment. Once the concrete is laid on the ground and the walls at the sides have been rendered it will look great….(hopefully). The dogs have found out that they can jump straight over the fence around the property and go for a nose around. There’s nothing I can do about it at the moment, and to be honest I don’t think I ought to because they have got to get used to people sometime soon. If they get out and cause a problem I’ll soon hear about it but Alf won’t go near anybody, Wilf will be the one who gets into trouble. He only wants to lick your face but the locals don’t even like touching a dog and are pretty scared of them so we’ll just have to wait and see.